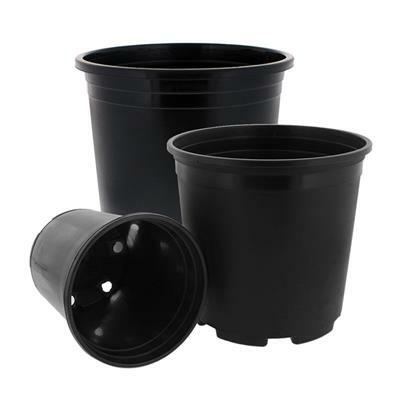 These blow-molded nursery containers are ideal for small shrubs, perennials and tropicals at an amazingly low price. Will reorder. Good lost cost trade pot. Fast shipping. Love these pots. They hold up well outside and I've ordered over 300 of these. As soon as I get done repotting my daisies, cone flowers and stella d'oro's I'll be ordering about 500 . These pots were just what I was looking for, inexpensive but not flimsy. I'm hoping they hold up for several years. I planted basil in them since we don't have space for a garden. They came quickly and are a great size. Well made container, good for many repottings, We can't order enough. great products with fast shipping. second time ordering. definately ordering again. Pots were as described, however in shipping the top and bottom pot was smashed. No complaints, quick shipping. Would order again. Your pots arrived quickly and in good condition. They are of good quality at a reasonable price and I will order again. Product met my expectations. Prompt service. Very satisfied.Will use again. I've purchased the 2000 series pots several times now and they are great pots for the money. Some are several years old and look great! They don't gouge you on the shipping either. You'll prob get an end pot a little crinkled on the top but no big deal. My tomatoes outstripped their 5 peat pots this spring and I was desperate until I found the Elite Nursery Containers. Perfect size and depth and a reasonable price and all 39 of my tomatoes are thriving in them! just what i wanted, sent fast, cant wait to grow! I bought this product to line a cedar potting bench. These pots fit the bench perfectly. They are very strong,good quality! I couldn't beat the price. I am very happy with this purchase and will be purchasing from you again. Heavy construction. Very durable container. Price is wonderful, perfect for my palm seeds.very happy! I've purchased this proctor several times and have been consistently pleased with it. It is an excellent value. Pots were okay, but the box arrived all busted up. These were exactly what I needed for growing micro tomatoes! Received in just a couple of days. Will be ordering more soon. They work good in the nursery. We use them for our daylilies! I just wish they were a little thicker and i would have given them 5 stars. i have been using them for a few years and will continue to buy more as needed. I do a lot of tree transplanting. These containers are invaluable for this and general outdoor cleaning out brush, etc. I will probably need more in the future. These pots are just what I needed. Great for sharing plants with neighbors and friends. Think this is my 3rd order and I will order again. Just what I was looking for. Speedy delivery and quality product. Looking forward to additional business. Hard to find better folks over the internet. Thanks! These pots are perfect for repotting extra plants in my yard. Hoping to sell my extras to good homes. Quite happy with them. Not thrilled....bought better quality, same price from Home Depot!! Just what I wanted and. Fast shipment, well packaged!! Great containers. Much better than I thought they would be. I ordered the 1 gallon pots. They arrived right on time and were perfect for my needs. I love this store for all my needs for gardening. The pots are very durable and are of high quality, and the shipping is really fast. I always use this store when I need pots. These containers were just what I needed for transplanting sweet peppers into. These are reasonably priced and are very good for what I need them for. We had a little mix-up on the shipping at first, but the pots are perfect. The pots are exactly what I needed at a good price and fast shipping. I have used these pots for several years and have never had a problem with them until this year. The problem is with the drain holes around the bottom of the pots. It appears that the machine that punches the holes was malfunctioning on the great majority of the order. It appeared that an attempt was made to punch, but one out of the four holes was only partly punched or there were only surface marks where the hole should have been. Product provides excellent value, will use to grow out Japanese red maples. Pots can be reused 2-3 years so very affordable solution. Great deal on a fine quality product. Service, as always was very good. I love your products. They are high quality and best of all, is the pricing! I will be buying from you again. Great container for the money! Can be used over and over. Shipping was quick and painless. Very pleased with the quality of the pots we purchased. They are light but the material is tougher than light weight pots we used previously. Received in very prompt order. Have not used yet but inspection shows them to be good products. I grow a lot of cacti from cut pads and I find these pots to be excellent starters. Delivered in great shape. When no longer usable, I will order more. Good product, quick shipping. I expect to use these for years for propagating shrubs and perennials. These were just what we needed for our extra plants to be potted in. We look forward to using these season after season now! Thanks GHMS.com!! Great containers and just as described! We've been selling peppers from our garden, and these high quality containers are perfect! Fast shipping too! These are the best value containers that I have ever found. These have proved to be excellent and I certainly plan to order more for next growing season! Got what I ordered in a resonable amount of time. They are gallon pots of normal quality like one might expect to get with a plant at a nursery. These pots have proven very durable and versatile for the cost. I have ordered the gallon size pots several times for my tree seedlings. They have withstood moving around several times and, in a few cases, attempts at destruction by two lab puppies. Fully recommend! The pots I received were of a higher quality plastic than I originally thought they would be. The thickness of the pots make them more durable than thinner ones are. I made a mistake on my order and followed the prompts on-line to get an Returned Authorization number before the return deadline. Never received. Now I am stuck with nursery pots that I ordered incorrectly. Quality of pots was OK. Shipping time was good, but on-line customer service leaves much to be desired even when I was honest and said it was my mistake. Buckets were perfect. Just what I needed to put my hosta in for sale. I couldn't find these anywhere else at this price. Local big box stores charged a little too much. While they're relatively cheap (about $0.38 per pot, includingshipping), over half of the 660 containers I received on my lastshipment had at least two of the five drainage holes blocked due toincomplete cutting, and at least another dozen pots had no drainageholes cut out at all. Since I do everything by hand, I can catch andfix this issue, though it at least doubles my potting time. Probably anightmare for any operation using any kind of mechanical potting system.I'm not blaming Greenhouse Megastore for this entirely, though perhapssome quality control inspection system would be good. Clearly themanufacturer needs to clean up its processes. I'll be shopping for a different brand of nursery pot for my next order,even if it's a bit more expensive up front, just to eliminate the time Ispend fixing pots. Product was well packaged and great value for the quality of product. I am using the gallon containers for short term transitioning of tree seedlings and this product perfect for this application. Great pots! They are perfect for protecting dahlia tubers from voles. They are also sturdy enough for repeated reuse. Love the pots - inexpensive, available , and right size!! This is just what I needed. to start my cutting for my shrubs. I got hundreds of these pots in different sizes in summer 2015. They held up over winter very well. However, since they are black, they get very hot during the summer and that heats up the soil and hence, the roots. I've had better luck with them planting shade-loving veggies and keeping them in the shade, where the soil doesn't overheat. Otherwise, they need watering way too often, and without a well, your water bill will show it. It would be much better if they would make them in a lighter color.Also, they had a strong odor of detergent to the point that it gave me a headache. I aired them out for a few days before planting anything in them and they were fine. They flex, they are not rigid, so they won't crack easily. I have been a satisfied Mega Green House customer for several years..... products are usually excellent. These were the worst pots I have ever seen. They either had the drainage holes 2-3 inches up from the bottom or 1-2 holes were not punched out at all. No way to use them. I talked to customer service (they were very nice) and was sent replacements. Same problem....majority were not usable either. These should not have been accepted from the manufacturer in this condition. Drainage holes are placed at the bottom for a reason so the water etc. can DRAIN out. (Plants would rot from excess water.) Quality was terrible. Great quality for the price. They won me over. Highly recommend. Shipped to a friend and she was very pleased. Great product and great price, delivered right on time! These are a much higher quality than the previous pots I ordered from Amazon. These also take a little less soil to fill and are retail ready (not squished like others). As with all my purchases from the Mega store, I am VERY happy with the quality, and sturdiness of these. The price cannot be beat! I did not expect the 2000 series (Trade Size 5 Gal) would be as large as they are but they will be perfect to raise bare root trees before transplanting. Order shipped within a few days of order. 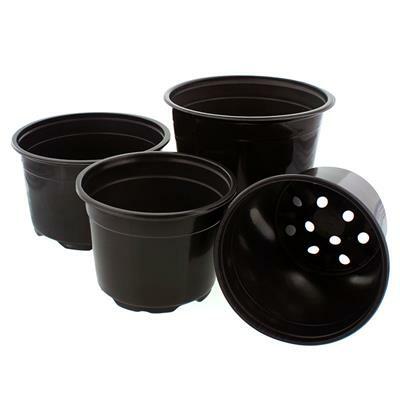 These black plastic containers work great for my wife to plant tree starters, aloe and just about any plant she wants to start. I really like the elite nursery containers 1000 series. Sturdy and just the right size for me. Thank you Greenhouse megastore for selling these at a reasonable price. I will purchase more in the spring. Ordered 180 of these to plant white oak acorns. Out of the 180, all were useable but 6 were slightly damaged (bent up) so I chose not to use them. One 2 cubic bag of potting soil filled 9 - 10 containers. I plan to purchase more in the spring. i give a 4 because there were 2 bad ones so far in 200 pots. They are good and big for my garden. Thankyou for selling them to me. Perfect size and order number. The pots are of very good quality and I will definitely purchase more of them.I also like the fact that these pots have and abundant amount of draining holes on the bottom. This will definitely help with some air pruning of the roots and allowing the plant to develop much healthier. The containers were good but little too big, will order next one. Pots are of nursery quality. Are very strong and durable feeling. The pot work really well for setting new seedlings for starters, works great. Pots are of nice size.Would be better if they were a thicker gage.Unfortunately they smell strongly of laundry detergent type fragrance.This makes me afraid of toxic or certainly inorganic residue. Very worth the value. I will order again and again. These containers seem fine. However, one day in the greenhouse I kept smelling a strong odor like that of laundry detergent or dryer sheets. I finally figured out it was the pots. I think they must be made of the same plastic that is used for black garbage bags that contain a deodorizer. I don't know if all batches have the odor. If you are chemically sensitive you will want to avoid these pots. I find the odor annoying but can deal with it. I like the options of the different sized pots. Also they came to my door very quickly after I ordered them online. I did not expect to have 5 uncovered 1 inch dia. drain holes (4 on the sides and 1 on the bottom)in the container. The potting soil would escape from these holes if not cover. These 1200 series gallon containers seem to be sturdy enough to last through several uses. I've not been dis-satisfied with any of the nursery pots that I have ordered. They arrive quickly and have proven to be a quality product. Also, the price has continued to be the lowest. Great product and price.Great company to work with. fast shipping.Will buy from again. THESE ARE VERY STURDY.. NICE QUALITY..
An economical container for a reasonable price that looks like it will probably last for a few seasons. I'm using them for containerized tree seedlings. I put a little bark mulch in the bottom as the drain holes are large enough to allow the soil to escape before it has time to compact a little. These aren't the best pots you will ever use, but for the low price they will do the job just fine and last for years. A great low cost money saving pot. Very pleased with the quality of the containers. I have ordered & used (660) total this spring. I will be ordering more in the fall. Also pleased with the cost per container. These pots, while a little bit flimsy, are excellent for the price. We ordered 100 pots and they were very quickly delivered. We are burying the pots and growing trees in them so the somewhat flimsy sides are of no concern to us. If we were using them above ground for an extended planting I would consider a thicker grade of pot. I purchased 300 Series Container & 1020 Tray, one tray to hold 6 containers. They don't fit as neatly as desired. A tray/container combo option would be nice. Your prices are reasonable and products are sturdy. A better pairing of materials/equipment would make me a loyal customer. Fast delivery. Good pricing. Satisfactory product. I bought these pots for my winter tomatoes. They are sturdy enough to hold up for a few seasons but are lightweight enough to easily move them around, if needed. These pots are great for the purpose and inexpensive. Exactly what I was looking for and quick delivery. 2 & 3 gallons are perfect for potting up Hibiscus and shrubs for next years sales, good quality pots without breaking the bank. Product arrived on time. The containers are a bit thin so if you are expecting to reuse the pots be careful with them. It is very easy to crack the bottoms if you are not careful. You can't beat the price on these. I'm was very glad that I made this choice, inexpensive and durable. These are gonna work perfect for my somewhat bigger plants. I can't wait to use them. I am more than pleased with the nursery pots. They arrived quickly, well packaged, and were priced right. I have used these plastic pots for a couple of years and can reuse several times. They are light weight and makes it easy to transport and store. I bought 300 of these pots and will be buying at least another 300. The quality is very good. I am using the pots for growing trees from seeds. Great product Even better service. Not much to say, as advertised, though I haven't used them yet. These pots work great for my daylily and the hibuscus I have been re-potting after growing from juvenile growth. Great price and great quality! Received these items quickly and they are as described. I look forward to building a supply of nice little plants for retail. Wish me luck. these containers were perfect for our bare root trees. just the right size. some were cracked but for what we wanted it doesn't matter. Exactly what I expected, and the cheapest price I could find. Arrived within days.Thank you! The containers were perfect, the size was right, the shape was right and they were sturdy and attractive.The price was right ! !They arrived in no time,sooner than I expectedI am very pleased !! I've ordered hundreds of the Elite containers in the 1-3 gallon ranges and they are all an excellent value. Greenhouse Megastore also gets 5 stars for always getting the products to my door in one piece and in a timely fashion! I have purchased elite nursery containers from Greenhouse megastore for several years and always received exactly what was described and exactly as promised until my last order. The containers were sold as bundles of 60 which I purchased 2 but only received 2 bundles of 50. After a few days of trying to decide if 20 containers were worth a hassle, I decided to email Customer service about my problem. To my pleasant surprise, no hassle, no problem, a few days later I received the missing containers. These folks are definitely the real deal and I will continue to enjoy doing business with them. The product is economical and reliable. Great pots for baby roses! I didn't go through pot by pot, but there was some damage from the machines that stamped the drain holes.Biggest issue is the damage in shipping, or the lack of protection to the ends while sitting on double stacked pallets in the warehouse.Due to the damage, I couldn't rate a 5, but since the damage I reported was made right, I gave a 4. If the damage wasn't corrected, you would have a one or a two.Peppers are growing well in the pots as I type.I don't know if you have these, but to keep the soil from going out the drain holes, I use a coffee filter. Something similar could be marketed for your pots. Items just as decribed. The winter storms delayed shipping, but once my order arrived it was exctly as described. Nice product for the price. Lightweight yet sturdy pots that drain well at the best price. I was worried at the time of ordering these pots. But when they arrived I was well pleased with them. I was so happy with them I purchased more. I ordered Elite Nursery Container and was appalled to find that there were no instructions, no warnings, no information at all.But that is not the worst of it. They were apparently not assembled. All i ended up with was 100 identical objects, no clue how to put them together, and they are empty!I don't want to pay the freight to return them, so i think that i shall start some onions. The containers were perfect for my need and the order went extremely smooth. Delivered in record time, very pleased! The container is not very sturdy for 6 inch Bromeliads, I will not purchase these again. Super fast shipping, great packaging and awesome product!!! I ordered thirty 3gal. containers to pot up rose cuttings. They were perfect for the job, and I was most pleased with their quality. I will be able to use these many, many times in the future. I have ordered these pots on several occasions as they are great for potting up plant seedlings that I have for sale. The pots are sturdy,drain well and are a great value. I would not hesitate to recommend them and will be ordering them again in the future. Rated 5 stars!! Elite containers are serving my vegetable garden well!! The pots are the best price on the net by far, very durable, & shipping is the quickest I've ever experienced. Literally arrived to my door less than 36 hours!!! Highly recommend Greenhouse Megastore!!! They arrive as described. One (the one on the top of the stack) has obviously been crumpled a little (its top rim) but its still 100% usable (just not as pretty as the others) so I dont let that effect my review. I was thoroughly surprise of how fast I received my purchase, but more importantly I am extremely amazed by the excellent product. It is nothing less that superb. It definitely exceeded my expectation. Thank You! These posts were exactly what I was looking for!They are very sturdy and were just the right size.Delivery was extremely fast. I will buy more items from your company. The one gallon pots were very serviceable and a good value. Just right for growing plants to one gallon size for sale. They are not however a heavy duty pot so I would not recommend for applications requiring repeated reuse. We ordered the 5 gallon pots which were shipped quickly and arrived in perfect condition. Even though they are made of thin material, they are really strong and exactly what we wanted. They look so much better than the collection of buckets and pots we used the previous years. We'll be ordering more next year as we expand our container garden. Good quality, great value. Arrived on time and all was as expected. Sturdy pots, very happy with the quality for the price. We are upsizing the pots on some larger trees we started last fall. We will be able to use these over and over. Containers are great, I ordered a lot of these, mostly with a quantity of 10 and they have worked out well. I did order the 60 count of the 300 series and only received 10 though so make sure you count. Good nursery container.###We apologize for the miscounted containers. Our customer service will contact you shortly to resolve this problem. Good price and items were received quickly. Some of the pots were slightly misshapened from packaging but this did not prevent me from using them. Would definitely order them again. In the past I've used grow bags for my greenhouse tomatoes. These are easier to use and should last a few years which makes it an economical purchase. Best price I could find on the web. I'm using these as in intermediate container for my hot pepper garden. These pots are fairly well made (sides are somewhat flexible, not rigid) and have nice, big holes in them for drainage. Highly recommended! Products arrived quick, packaged well and sturdy! excellent price and very fast shipping. I got exactly what i ordered in a very short time. I am very pleased with the product. I'm a repeat, repeat, repeat customer! Great pots at a fair price! They work great in my nursery. I'm a repeat customer. Great pots. Price is right. Great service, great product! Easy on line ordering. Completely reliable. I could not have asked for more. High quality and satisfaction with this item. A reorder, so pleased. We searched all over for a good price on nurcery pots and were stuned by the cost!!! We are just a small operation, just getting started and don't have much money. This is the BEST price on the net for pots!! Good quality, fast delievery. We will definiately reorder! Excellent product and perfect for my needs of planting mirlitons to sell at our local farmer's market. They are also half the cost of the previous containers I was using. Extremely happy I found this website. Exact product to meet my needs. 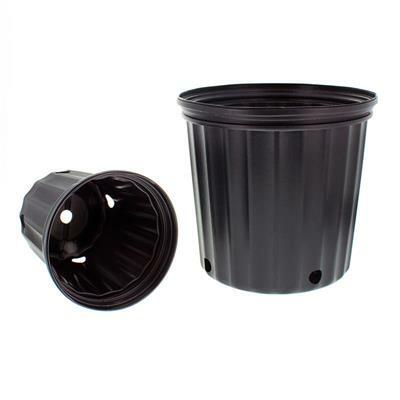 Lightweight and easy to work with, this product will act as a good temporary planter for developing plants. Super fast shipping and great prices.Very pleased with my previous orders for the 5 & 10 gal. elite nursery containers. These containers are strong and durable, and should hold up nicely. Good quality, timely delivery. No complaints at all. These are the perfect size for my various plant-growing needs and are holding up well. Currently, I have extremely tall heliconia growing in 15 of the pots without any support stakes necessary. I have nursery stock in the majority of the remaining 100 pots. I will be ordering more of these once I deplete my stock of them. These are great pots for starting plants. They stack very well and take up little space. They are fairly durable and should last several years. I like that they aren't hard plastic. They have some flexibility. I plan to order more next year. good strong pots. I've has some similar pots at nurseries tear when i pick them up by one edge. I'm definitely ordering more from this manufacturer. This company sells the things I need for my plant and tree products. Good quality and fast, reasonable shipping. Thanks! Excellent pots and the price are reasonable (10 per bundle). Excellent pots and the price are reasonable (10 per bundle). Would like to get more. Wish they make 7 gallon too. Only company I found online that had the correct size that I needed. Prices were the best; shipping was fast, accurate; communication was fast and kept me in the know about my order. An excellent online ordering experience. I do container gardening, and these are ideal. I expect they'll only last a few years, but at 80 cents each, they are still the cheapest alternative, and do the job just fine. I am a homemaker who is also a grower of many plants, shrubs and trees. I was so happy to find your website and be able to purchase the pots necessary to do this. Thank you for the good product and great service! Best deal on gallon nursery containers, well built. I was very pleased with not only the planting containers I purchased, but also the customer service which is very iffy these days. The price was not only the least expensive that I could find, but the order was filled very quickly. I highly recommend the Greenhouse Megastore. I received containers fast. They were perfect and the holes were just right for drainage. Thank you! Exactly what I wanted, and very fast delivery. Cheap plastic pots for my garden on my back deck. Easy, cheap pots+ Miracle Grow potting compound=SUCCESS! Containers were just as described, very quick shipping & very reasonably priced. One gal pots are just right for my Cajun Hibiscus cuttings, I Sell or give away as gifts. 2 Gal pots are great for my Cajun Hibiscus cuttings I decide to keep. not only were your prices, one of the lowest I found while shopping, they were delivered fast and used the same day. Very satisfied customer. ...this site years ago! Love the selection, price, and quick delivery. You need to advertise more! I live in a very remote agricultural area at least 30+ miles from a major shopping area. There 2 huge commercial nurseries that ship their products all over the country. They buy these pots by the thousands but will not sell them in any quantity to anyone. The only way I've ever been able to get these pots was to buy a plant or be fortunate enough to find someone who was throwing them away. Now thanks to your store and the internet, I can get these pots, as many as I want, in any size, and have them shipped directly to me. The prices are beyond reasonable and I can use them for many years to come in or out of the ground. Thanks for making your products available to the general public, particularly the 'little ole lady' home gardener like me. Sand is the planting medium in most of the area I live in. We are blessed with lots of woods and the mulch and top soil they produce. We also have an abundance of voles that love nothing better than to wait until plants are at their peak of beauty or just ready to bear fruit to attack. I've tried to protect my plants with rocks, crushed cans, newspaper, wood chips, you name it. I even put boarders of my cat waste around the flower beds and they sometimes still get through to those luscious roots. When they do, they call their friends and before you know it, the whole bed is a hump of dead vegetation. Your pots are the one thing I have found that I can put into the ground and leave. It helps hold moisture during our drouts, drains well during our hurricanes and best of all keeps the voles and moles away from the precious roots. Thank you for making your pots so affordable and available for home gardeners like me. These pots are perfect for most vegetables like peppers, tomatoes, cucumbers and squash. They hold enough soil for a good root structure and help maintain the right amount of moisture for good plant growth. I can plant from seed or pot. I can keep above ground or sink pot-an-all in the ground and never worry about replanting. Plus I can use the pot again and again. Thanks for making these pots so affordable and available. Shipping was lightening fast too. Thanks again for your business. These containers are great! The only thing I would suggest improving on is making the top part that you grab onto to pick them up a little bit stronger. When they're full of dirt, they get much heavier. The lip that you grab onto when picking them up could be thicker so it doesn't break. The drainage holes could be smaller. Other than that, they are a great deal & very user-friendly. 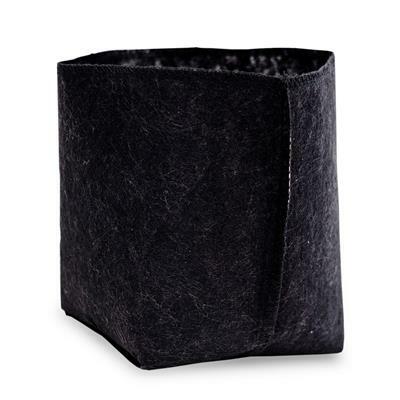 Great product, exactly what I wanted and they are perfect for what I want. Good products. Bought the 3 and 5 gallon liner and love them. The price is right and super fast shipping. Will continue ordering when I need more. These pots are like most any pots on the market. They do the job they are designed to do. What I appreciate, is the price. They are one of the most inexpensive sources I know of. Exactly what I needed for a great price, and shipped promptly. They are thin containers but sturdy enough to do the job they're intended for. the containers were delivered on time but the container its self is smaller i dont really think it is five gallon unless it is measured in a different way.containers are okay for growing vegetables in just the size looks off. This is the second time I have ordered pots from Greenhouse Megastore and each time I have quickly received my order with a very reasonable price. My Girl Scout Troop is trying to earn enough money to go on a trip this summer. We decided to grow flowers to sell. Our order of a 100 pots was a great price for a low budget project and the shipment came really fast. Thanks! Product and Delivery were completely satisfactory. The product is suitable for all your outdoor gardening needs, it comes to your door exactly as described in a timely manner, and can be reused for years to come. Keep in mind these are nursery pots, plain and simple, nothing fancy about them. Our ladies group from church every year divides our own periennals for a plant sale to earn money for projects at church. With the early spring the pots were put to use very quickly! Thanks for a cheap and great product. Good plant liners. Fast shipping. Good price!!! Perfect containers for my Nursery. Best prices and fast shipping. This is my second purchase. I'm very satified! This was my first experience with this store and wasn't sure about their products. So I ordered these containers and they were exactly what I needed. The prices were great and so was their customer service and fast shipping. I am a happy customer and will continue to shop here. good product at reasonable cost. These are the same pots the grow shops sell for a whole lot more. Performed beautifully. Great pots! Already ordered some 7 and 5 gal pots also. The pots seem strong also. Its what i was looking for.Raising hottest peppers in the world.Shipping was fast,and i saved $25 on shipping over ebay sites. I purchased 3 gallon nursery containers for my tomatoes. They work! I'm using these large containers for growing pineapples without having to dig holes in the coral rock ground. I had 14 pineapples this year, and plan on more next season.Good price, great product,and fast service, Thanks. I thought the pots were going to be of a thicker material-maybe a little more info., but nice service over all.Thanks they came just in time. Ordered 30 pots , got 31.great pots, just what I needed. We use the Elite 2000, 1200, and 200 series containers. They are well built and stand up to our heavy rotation practices. Just what I wanted. Sturdy but light. Good price too. All of the pots I have bought so far are good. Intend to order some of the 1200 and more of the 7 gal. I loved the quality of the product, just great for the project I'm working on at home. Your shipping time was very good too, considering the distance where the product was coming from, but i'm sorry to say that you will need to protect the merchandise a little more because it was disappointing to find three of my most needed pots broken. Big Pots are expensive and this is one the best deals I've found on big pots. Worth the price if you order some smaller stuff in the shipping cost. These are inexpensive, so not top quality. Perfect for greenhouse or outdoor use. Final Conclusion:Does the Job & it's the Best Deal around for bulk large planters! or exceeds any and all expectations. Wish there were smaller pots for plants that I could also take advantage of! Hunting, Hunting,Hunting! Excellent containers for the price no doubt. I've searched around and these look to be the lowest priced out there even with the shipping added.And quite a good pot for the tomatoes we grow and sell. Exactly what I was looking for, at a great price, and the pots will be used over & over again. Thank you so much. Great product for starting those many plants you have been meaning to work on. Try getting these suckers at any other place. Impossible. I am glad that the Greenhouse Megastore provides larger numbers of products. It's hard when you need more than 3 but not 2,000. This is the only site I've found for people like us. Thanks again. The containers should last several seasons if I treat them right. And I live in the hottest part of AZ. It serves the purpose of inexpensive planters of transitional use. 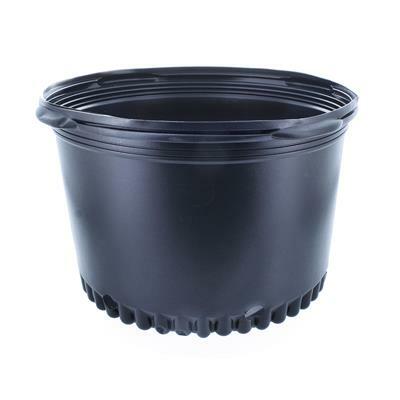 Standard HDPE black nursery pots, reasonably priced, 2 pots damaged during shipping, but still usable. Great value pot. Wonderful for sales/nursery -exceptional price value too. Sturdy, durable. Product as expected at a great price. Quick delivery a plus. This was an excellent choice for container gardening,and well worth the price. Great pot for holding tomato plants & other vegetable plants prior to putting them in the ground. There are plenty of holes in the sides and bottom to allow for proper drainage. Planters are not quite as heavy as commercial planters at my local nursery, but are certainly strong enough for the shrubbery clippings around my yard. I am very pleased with the price and quality. It's a good buy for it's low price except for the high cost of shipping & handling... A.P. Great service, good product at a very reasonable price. For value, you can't beat these. They are lightweight and stack well, and they seem to be nice and sturdy. 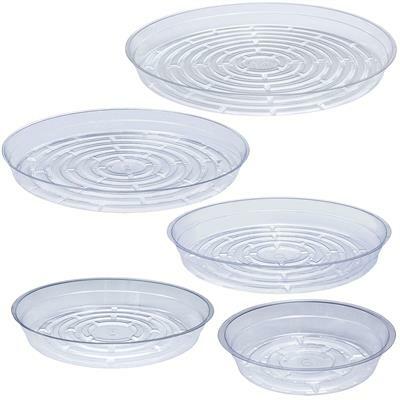 These containers are awesome and very easy to use....they are sturdy and well worth the price. The containers arrived earlier than expected and of course they were of excellent quality. Thank you and I will be buying more. These were just what i needed! I'm an avid gardener and I grow palm trees from seeds. These containers are inexpensive, nice quality and perfect for potting. These are great! They look good & the outside texture keeps them from getting so dirty when rain splashes dirt on them. I will be ordering more of these & in different sizes. Shipment was prompt. The product was exactly what I needed: an inexpensive way to pot several dozen plants. The containers are not pretty, but they're not supposed to be. If you're looking for a low-priced way to pot a large quantity of plants, and don't care about aesthetics, these containers will suit you fine. I love the Elite black containers for all my nursery needs. I grow three varieties of Jasmine and three varieties of Basil. I sell them in these gallon containers so that the buyers can keep them growing in these containers for a while before transplanting them in fall. One thing I would like to see in these containers is a reduced size for the holes. Currently, a lot of expensive soil is washed away through the large holes even when I use pebbles to block the holes. It would be wonderful if we had a choice of small holes (about half inch circle) and more of them compared to fewer 1 inch size holes. Thanks for selling this product. I love them anyway. These are the perfect containers for growing small plants before transplanting into the ground or permanent container. I am growing plumerias from seed and this was the perfect step in the growing process. My plants were about 3 high and needed room to grow to the next stage. These containers will serve as their home for the next year! I'll purchase them again when I'm ready to do it again and I suspect that I will buy some of their other products as needed, too. I made my order from Canada, and in little over a week it arrived at my door. Great service. I needed containers and did not know where to find so looked on internet and just picked a company. Could not have done better with any one else. Am very pleased and have ordered several times now. Thank you. I was looking for utilitarian containers, not something decorative. to re-pot tomatoes and peppers. These are durable and the price was so much better than I was able to find anywhere else. I am very happy with the product, the price and the service. UNIFORM, GREAT CONDITION, NOT NARY A COMPLAINT. GREAT PRODUCT, GREAT PRICE. The Elite Nursery Container is well made, sturdy, strong and very nice looking. It was worth the cost and I feel sure will last a long time. I am very pleased. Actually, Greenhouse Megastore did one better and shipped me an upgraded product for the same price rather than have me wait on back order. Now, that's what I call customer service. I have yet to be disappointed by the company. Thanks, guys! I purchased three and five gallon Elite Nursery Containers. I have used the 3/5 gallon containers for one year old tree saplings. I am very happy with the products. I also like that the Elite Nursery Containers are a #2 plastic and that they can be recycled when worn out! Elite nursery containers were just what I expected. Great quality and a good price! We have purchased potting containers from 1 gal. up to 5 gal. and have found them to be very sturdy and durable for our needs. Delivery was prompt and quicker than expected . Well satisfied !!! This product is the perfect size for growing Blueberry plants to bearing size. The appearance is superior to all others that I have tried and the container holds it's shape better than other low cost containers that I have tried. The 2.5 is perfect for potting up from trade gallons or growing liners to market or bearing size. I searched the internet for this product but found it here at the best price. After receiving them I was pleasantly surprised by how nice they are! For the price you simply can't beat them! They will work quite well in our nursery business. My husband and I use these post for plants that we separate. They work great. They are durable and functional. These are good quality pots. I have purchased other 1 gal black pots from other sites, but have returned to purchase these because of the quality of the pot. The plastic is a little thicker than others. These pots are great for my daylily seedlings until they are ready to go into the ground...the price is right and shipping reasonable for the quantities. I'll be a regular customer! I have researched the web looking for prices far most the best prices out there i will be buying more products from you guys as i expand as far a quality i have nothing bad to say just don't increase the prices on me now. This product was delivered very quickly and was so easy to acquire. The other nursery supply sources wanted you to order 100 and I am starting small. Grow home gardens with this product! 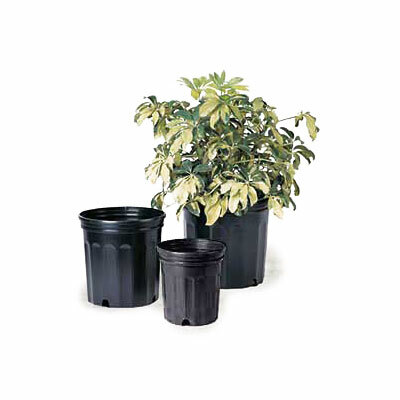 Plant small trees, shrubs, and more for growing massive amounts of plants in these excellent pots. I've bought 50+ from this site. The Price is the best on the Internet! Great product. I will purchase more! Thank you very much GHMS! Fast delivery. Needed 25- 5 gal. pots to transplant blueberry plants. The product is priced economically and is made well for those transplants that have gotten too, too big. Good price, prompt delivery. I couldn't be more pleased. Thanks. I bought my containers in August 2007 and they had done great. Even after being filled with plants - kept in the sun in a Georgia summer and 2 winters in a greenhouse the pots look brand new. Thanks for a great pot and a great company-my order was filled quickly and JB (sales ID) was very helpful. i needed five gallon containers for a patio garden, i checked the garden centers for an affordable container, the price and the number of containers needed for my garden would make the cost excessive. i searched the web and luckily found the green house mega store and could not believe the price. i ordered a shipment of (25) started my project, and was so pleased with the the order processing and fast shipment that i ordered an additional (25) to increase the size of my garden. friends have been so impressed with my project, several will be placing orders soon. i will send photos soon. I ordered the 3 gallon size pots. I found this to be the best pricing. Delivery was received within 1 week. Communication was excellent in notifying me of the shipping date and tracking info. Containers received in excellent condition and well packaged. Will definitely order from again. Excellent value and customer service. I ordered the product over the weekend when the store was closed. My order was processed early Monday and shipped the same day. I received my order in three days. The product was exactly as described and the best price I could find (even with shipping). I have a small propagation nursery and use the containers for nursery stock and ornamental grasses and bamboo. I will order again. This is the best price I found on this container, and I really did a lot of searching, locally and on the web. I ordered one unit of 60 for the first time, and I was so pleased I ordered two units for a total of 120 the second time. I'm sure I will be using your products more. Thanks for a job well done. Practical and inexpensive way to have a strawberry garden even when you don't have a garden. The pots are just the right size. 1-2 plants per pot, and you have strawberries everyday for a long time (with everbearing strawberries). Pots are reusable, out of reach of slugs, bugs, and other pests. Individual strawberry plants are easily replaced as necessary. Line up a couple of dozen pots on benches at waist-level. Tending, watering, and harvesting becomes easy for all, young and old. Fresh strawberries with waffles everyday for many, many days. Yum! I was happy to find these pots at such a low price. I am growing vegetables indoors during the winter to take outside once it gets much warmer. I needed larger pots but all the ones I would find were way too expensive. These are perfect. These pots are a great value, perfect for starting small shrubs and roses. Service from Green House Mega Store was great. First time I order from this company and everything about it was good. Good product and service. Best nursery supply I have found and the one I am using again this year. They are durable, can be reused, and the price can't be beat. They are your standard containers for a reason, you can't get this quality for this price. Super value. my only concern is that these containers are not very rigid and if you have to move your plants around a lot the root ball will be disturbed. that said you can't beat the price. Best price I found amongst many suppliers for a comparable container. Great service and fast delivery. I will buy again. Thanks. These came in so handy when we acquired some sago palm babies. Perfect size and worked perfectly for our needs. 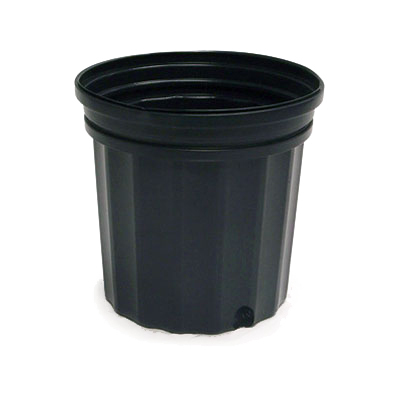 These Elite Nursery containers are very nice and can be used for a large variety of plants. My 60 1 gal pots arrived today in perfect condition and I cant wait to transplant the flowers growing in my new greenhouse. Love the value and quality of the pots I purchased from you and will surely shop again!!!! I ordered 4 x 60ct bundles of these blow-molded pots and received them within eight days of placing the order online (2 days from the date they were shipped). Good quality pots and the price was better than I could get from a local supplier when I figured in transportation costs! I did a lot of looking around online and this supplier had the best overall prices for these pots in this quantity. I ordered the black pots and received them right away. The price was very reasonable and the quality of the pots are great, which means that I will be able to use them over and over again. Thank you! This was my first order with your company I I am very satisfied with the pots, a nice size for seedlings and larger plants. Sturdy construction, Quality item. Great value for the price. It is great to be able to buy smaller amounts of greenhouse supplies. Hats off to the Greenhouse Megastore for providing this service. The 1 gallon pots were exactly what I needed. The price fit my budget and the product arrived quickly. I started growing plants from seeds this summer and needed pots to transplant my seedlings, however I was buying pots from the regular stores. I finally came to the conclusion that I needed the type of pots used by nurseries, that, I put pots in the search engine and found International Greenhouse and ordered my pots. The one gallon containers arrived in three days and I replanted thirty plants. The plants are growing and looking great and I don't have to worry about them being root bound. I will order other gardening supplies from this company because I not only saved money and continue to save money by using their wonderful products. The wonderful gesture of receiving a followup letter in the mail was really appreciated and let me know that this company is not only dedicated to fine service and quality products but to their customers as well. This is my second purchase from this company. I rec'd the product quickly, in good shape, and a very good bargain for the money. These are lightweight, but seem to hold up well. I will purchase from them again. I researched prices and their prices are the best I could find. I will buy from them again. I have placed a few orders for this product. As I need more, I log in and place my order. I am very satisfied with my purchase and plan to stick with this product for future purchasing. Love it!! I got my order in just a few days and will DEFINITELY order again. Because I used all of them in less than 1 week. These 1 gal. pots are the right price for the quality. It is a bit deceiving calling them 1 gal. pots. I realize there must be an industry standard , but my advice to potential buyers would be to go up a size from what you expect. They hold two and a half liquid quarts. When checking my vast collection of pots there is a big difference in size amongst 1 gal. size, but these are the smallest. I was impressed at how easy it was to find exactly what I wanted so quickly. Price is extremely competitive and delivery was very quick even through the holiday season. These are extremely affordable and very practical. I ordered similar pots of a different make from a another company that split down the seams if you grabbed them by the lip and carried them. These are very sturdy, make excellent temporary pots for things like up-potting. They arrived quickly (with affordable S&H, too), well packed, and are exactly what I was looking for. These pots are a very inexpensive alternative to fancy floral pots. When doing a large number of items (as an example, when wintersowing for a large garden), they're very useful. The pots can be cut with scissors, stapled with regular office staples, and otherwise can be very useful. However, on that same note, they're flimsy enough to be cut with regular scissors. In general, I prefer injection-molded pots, but for temporary holdouts and when I need a very large number, these are a definite good value for the money. containers are very durable and will last several years. Spent lots of time online trying to find this size at a price I could actually afford but did not have to order by 500's, 1000's etc. Just what I wanted plus good customer service and prompt delivery. Highly recommend! I use the 1,3, and 5 gallon containers to transplant roses from band containers into larger containers. I also cut the bottom out of the 5 gallon containers when I want to plant a rose 6 inches higher than some of my existing plant beds.